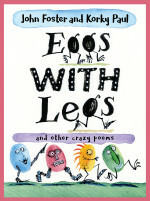 Eggs with legs are the least strange of the weird and wonderful creatures which dance and prance through this book. Korky Paul is one of the best illustrators around and these nonsense poems by John Foster lend themselves to his inimitable style. The collection is absolutely stuffed with pictures of various things animal, vegetable and mineral doing silly – and a lot of the time pretty scary – things. Within its pages you’ll meet a flying haggis, Flim Flams wearing jim jams, the slithering slubberdegullion, a cartwheeling curlapop, some very peculiar teachers and quite a few folk with fabulous fangs. It’s fun and I like the cardback format.